This day has been a long time coming. Our family have talked about moving (back) to The Netherlands for months…even years. Finally the day was here. If you had one day left in Australia what would you do? My husband and I started with a walk along the beach (we’d been staying in a unit in Caloundra for our last week). 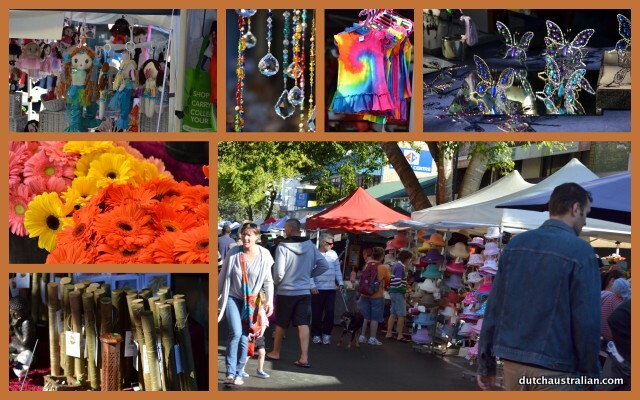 We walked back via the main street of Caloundra, through the vibrant, colourful Sunday markets. Then we headed to my parents place nearby to begin the sad goodbyes. Our girls had stayed overnight with Nonna and Nonno (my parents) and this was a difficult day – these are their only grandchildren. Any dual national with family in more than one country will no doubt understand this is one of the hardest parts of our life. Finally, we went back to my parents to finalise the packing, weigh the suitcases and say the sad goodbyes to my parents. We stopped by our house in Kallangur to pick up some post and said a quick goodbye to the neighbours. Our flight was at 10.45pm on China Airlines, so by the time we arrived at the airport we had two tired grumpy girls already. Sophia has just turned 5 and Isabella 3 so it was a late dinner for them. Check in went fairly smoothly, our 79kg of baggage checked in and then just time to wait for boarding. The wait at the airport seemed to take ages and we already pulled out the iPad to entertain the girls with their brand new headphones from Uncle Mark. They looked like seasoned travellers already with their cute tulip skirts giving away our final destination. It was all rather surreal as we settled into our seats for the very, VERY long journey ahead. The girls didn’t really have much concept of how long it would take as this video shows! More in our Day 2 post. Thanks so much for sharing, Renée. I believe there are so many of us who understand. A good time of the year to settle into the Netherlands (again). I’m sure that you have not had your last day in Australia. The glass-half-full-part is the enjoyment of both countries. It is a good time of year though hasn’t felt like summer at all yet – everyone keeps saying “next week it will be good weather”. I am not sure if they literally mean next week or whether they will just keep on saying this forever!